Vastra – An International Textile and Apparel Fair was a 4-day event which was held from 21st to 24th September 2017 at the Jaipur Exhibition & Convention Centre in Jaipur, India. Vastra drew in more than 300 professional exhibitors, looking to showcase a diverse range of textile and garment products of elite quality. Leading manufacturers and suppliers of plant and machinery, accessories, dyes, chemicals and technology suppliers, fashion designers, countries and states through specific pavilions, sectoral industry associations, international industry associations, research and development, education and training Institutions form a major part of the show. 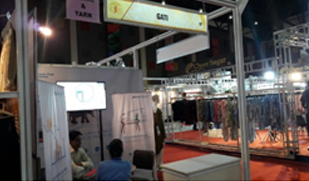 Gati has been providing cost efficient and effective logistics service to textile and apparel manufacturers and many other leading industry verticals. In addition, we also provide Gati Fulfilment Services through which traditional or new companies can launch their business online. The Chennai Silks, Indian Terrain Fashions Limited, Pantaloons Fashions Retail Limited, Turtle Limited are some of our clients.